On April 30, the Manitoba provincial government will present its budget for the coming fiscal year. You can be sure that within the budget package the government will trumpet the tax savings that it has bestowed on Manitoba wage earners over the years. You can be equally sure that there will be no mention of the fact that personal income tax brackets have been frozen for the past 5 years and 10 of the last 12 years. This strategy of freezing the tax thresholds is likely to remain unchanged as the government struggles to contain spending and balance the budget, thus continuing the relentless clawing of hard-earned money from our wallets. Is it a real tax? Yes. It is just as real as an increase in the tax rate. The difference is that the later is more transparent and easier to understand. It is a visible and obvious change to the amount of tax that you pay, whereas bracket creep is a passive and “hidden” tax increase. The Canadian Taxpayers Federation has been highlighting this Bracket Creep for years, but there is seldom any other mention of it. Part of the problem is that there are few concrete numbers associated with the increase. If the Manitoba government implements a tax credit of some sort, it publishes the value of that credit so that it can be sure the press will report on the “_____ tax credit that will save Manitobans $X million per year”. 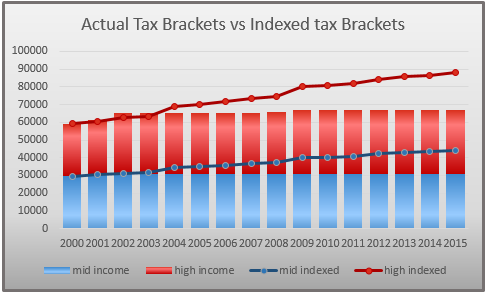 Does The government publicize the value of the tax increase due to bracket creep? No, of course not. What we need are some dollar values and real examples of how people are impacted. Here’s an example: A person who was making $25,000 in 2000 and who had wage increases only at the rate of inflation, would have migrated from the low income tax bracket to the middle income tax bracket in 2012 because the tax threshold increased only ONCE in that time, and by less than $500. 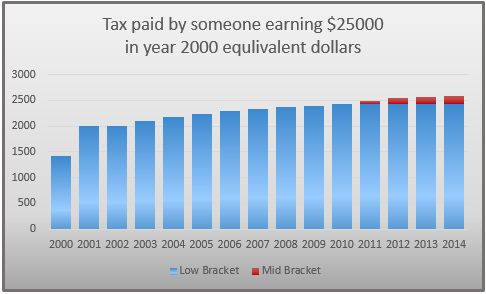 So while their gross income has stayed the same in real terms, they are paying a higher rate of tax on every additional dollar they earn because of bracket creep. This problem doesn’t just impact people who graduate from one tax bracket to another. The problem impacts everyone in Manitoba with an income of $31,000 or above. In fact, almost half a million Manitobans are in the middle income tax bracket or above, and are a victim of bracket creep. The impact of bracket creep on a person one given year may not be great, but over time it eats away at an individual’s buying power and earns the government a tidy sum of scrutiny-free money. But … how much money? If the government freezes the tax brackets for another year, how big of a tax increase will that represent? The tax bracket freeze for the 2015 tax year will cost Manitobans $14.4 MILLION. But that doesn’t begin to describe the real impact, because the effect is cumulative. Tax payers are impacted this year by the failure to index the tax brackets in the previous years as well. In fact, if the NDP government had increased it’s personal income tax thresholds by the same percentage as the federal government each year, Manitobans would get to keep a staggering $307 MILLION more of their income this year alone. The cumulative cost of bracket creep since 2001 is almost $2 BILLION. THAT is the cost of bracket creep. It is a TAX INCREASE that has been happening for years, and the impact get larger every year that it continues. The federal government and all but 2 other provinces (PEI and Nova Scotia) index their tax brackets every year. If the federal government increased the tax rate in the next budget every media outlet in the country would call it a tax increase. But when the Manitoba government fails to increase the tax bracket thresholds it generally gets a free pass by the media and subsequently by the voters. Governments need money to function, and sometimes tax increases are necessary, but when that is the case they should be done in an open and transparent manner. This particular form of tax increase is anything but open and transparent. It is a denial of the existence of inflation that claws an increasing amount of income from tax payers each year without any accountability, and it needs to stop. The government needs to be made to justify this tax increase just like any other, and that starts with quantifying the impact it’s having on Manitobans. That impact, in 2015, is $307 Million. ← Is Rana Bokhari doing enough for the Liberals?